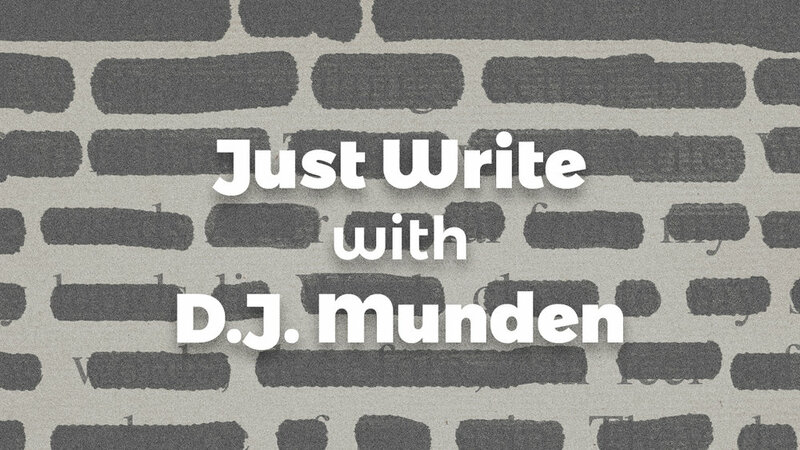 Hello, I’m Deston Munden (or by my pen name D.J. Munden). I’m an epic fantasy and science fiction author from a small town not far from the Outer Banks of North Carolina. I have a Bachelor’s Degree in Game Art and Design with a focus on creative writing. I’m also a huge fan of video games, books, music, drawing, anime and cooking. Reading and just being creative is my main inspiration. I feel like it’s a rare thing to try to do something that you really want to do. Some people live their entire lives jumping from one job to the next, never taking the time to find what they want to do with their lives. This is what I want to do with my life. I didn’t realize how bad I wanted or needed to do it until this past year. I thought to give it a try and get serious. My process is simple…well, kind of. I just write for the first draft. No outline, no anything; ideas and words in an endless stream of pain (also love, they’re interchangeable). When the first draft is finished, I put it away and start on something new. I have some of my close friends read over the draft I shelved and give me some pointers while I type away on a new project. Once all the feedback and the next draft of a new book is finished, I go back to the first one. By then, I’ve improved. I write down notes, details, and an outline after my first draft and on my second (weird I know). From there it’s getting more feedback and editing until it’s ready for release. Your process is pretty unique! Did you come up with that on your own, or did you stumble upon it somewhere? Thanks! After writing a few failed drafts, I developed this process on my own. It's like beating your head against a brick wall but actually getting results on the other end. As much as I tried to outline and get it organized before I started, I couldn’t get it quite right. So, instead of worrying about it, I decided I was going to have to write first, outline second, and then fix inconsistencies and fill in the blanks as I go. I’m pleased that it worked out in the end. I can finish things now and not be completely disgusted at the result. I’m currently using Microsoft Word and Google Documents for the actual writing. My real trick is Natural Reader for editing. It’s a free text to speech software that allows you to listen to your own writing. It’s scary at first, listening to your own stuff but once you get the hang of it, you get to hear the flow of your sentence and paragraphs. Also, you get the express feeling of how dumb some things sound first hand! It’s a win-win. I want to pick up Scrivener once I have the time. Crippling self-esteem and anxiety. I’ve lost so many hours of sleep thinking “am I good enough to do this?”. I’ve had so many people tell me that I’m wasting my time or that I’m not talented enough for it. I’ve lost count of the times that I’ve talked to my fantastic friends and family, crying and upset because I want to do this so badly. If not for them, I don’t think I’ll be sane anymore (well sane in the relative term). To writers in my situation, find some good people to surround yourself with. Let them be critical but nice to you. You’re an adult and you deserve a critical eye and good words. My biggest strengths are my dialogue, characters, and battles. Dialogue and characters were always easy for me to handle, even when my narration and grammar weren’t readable. I love over the top battles with magic powers, mutants, swords, guns, you name it. There are some cool battles in my books (the beta readers said it, not me, I’m validated). Against all odds, write. That’s the scariest part. You’re going to want to be perfect in your head. You want to be the next George RR Martin, Brandon Sanderson, J.K Rowling, etc. You aren’t going to do that with a blank page. You’re going to have to learn to squash that voice in your head and write. Even at the end, it won’t be perfect. It can’t be. Perfection doesn’t exist. Write. Write like your life depends on it. On the flip side, take breaks. Cook yourself a nice meal. Go outside (oh god why). Read a book. Watch some shows. Listen to your friends and family telling you not to kill yourself from hard work. You’re human, remember. I love your advice to just write. I definitely struggle with being a perfectionist, and it's tough for me to set that aside and just flow. Any tips for others like me? I’m also a perfectionist to the point that my friends told me to chill. I’m not going to pretend like it’s going to go away. That voice is going to scoff and tell you: “huh, you think that’s a book? You think that’s a scene? Why are you even writing if you aren’t going to be Tolkien overnight! Your grammar is trash”. Okay, that last one might be true in my case... Anyway, you’re going to have to learn to acknowledge that what you are seeing isn’t going to be what your readers are going to see. You know your book, it’s been living in your head for months, years, or decades. You see everything that's wrong. Usually, they won’t. Work on your book! You can’t share it with people if you don't get it done and out there. You can always find me at @SrBuffaloKnight on Twitter for now. I’m currently working on a website. You’ll hear about it first there. Hopefully on Amazon and a book distributor near you. Right now, keep an eye out on my Twitter and you’ll find a place where you can read something nice later. Tavern and Dusk Mountain Blues might just sneak up on you. Deston is a really great guy, and it's been really exciting following his work! He's currently in the process of querying Tavern (wink wink, agents) and I can't wait to see where it goes! Bonus! If you're like Deston and interested in Scrivener, the fine folks at Literature and Latte have given me permission to offer a 20% coupon code whenever an AfterWord mentions Scrivener! So visit www.getscrivener.com and use the coupon code AFTERWORDS to get this great deal!